The liver is one of the most important organs in our body, necessary for survival. Until today there is no good method to compensate for liver failure, treatment is costly and liver transplantation is not always available. About 2 billion people worldwide have been infected with the hepatitis B virus, which is 50 to 100 times more infectious than HIV; and approximately 600 000 persons die each year due to the acute or chronic consequences of the disease. In the case of hepatitis C, an estimated 270-300 million people worldwide are infected – and 50% of them do not respond to any therapy. The liver has a unique double blood supply, from the liver artery and from the portal vein. Without a doubt we can say that this organ plays a central role in the metabolism and many other functions of the body, like glycogen storage, synthesis of blood proteins e.g. fibrinogen, which is important in normal coagulation, synthesis of hormones, detoxification of toxic ingredients in food or microbial products and also bile production - an alkaline compound required in digestion of lipids. Considering all of livers special functions and its anatomical location, it is frequently exposed to a large load of intestinal antigen that includes pathogens (viruses, bacteria, parasites), toxins, tumor cells and harmless dietary antigens (Mowat 2003)1. Of course the liver has mythological abilities to regenerate but in some dangerous cases this organ can be seriously damaged. Statistics and epidemiological data say that except from alcohol and drug overdose the main reason of liver damage are viral infections due to Hepatitis, especially B (HBV) and C (HCV) forms. Hepatitis - a world-wide health problem. According to World Health Organization about 2 billion people have been infected with HBV and about 350 million live with chronic infection. An estimated 600 000 persons each year die due to the acute or chronic consequences of hepatitis B. In the Western civilization, vaccination against HBV is offered to health professionals and police who are exposed to individuals with hepatitis. It is important to know that this vaccination is effective only for about 95% of population and the protection level of antibodies decrease with age. Although hepatitis B is endemic in China and other parts of Asia (8% to 10% of the adult population is infected), about 1% of the population in Western Europe and North American is chronically infected. Another very dangerous virus for the liver is hepatitis C because of its lack of symptoms for a long time. HCV is a major form of hepatitis and similar to hepatitis B because both are transmitted sexually and by blood and lead to chronic liver disease i.e. cirrhosis, and liver cancer (50–76% of all liver cancer cases). About 180 million people are chronically infected and each year 3 to 4 million persons are newly contaminated. In contrast to HBV there is still no vaccine available to prevent hepatitis C.
And the treatment for chronic hepatitis B/C is costly. Depending on countries and the development of the health care systems the treatment could be limited to maintaining comfort and adequate nutritional balance to help replace fluids that are lost from vomiting and diarrhea. In developing countries chronic hepatitis B/C can be treated with very costly drugs like interferon alpha and anti-viral agents (ribavirin), which are only effective for some patients (interferon combined with ribavirin is effective in about 30% to 50% of patients in HCV treatment). On the website of the National Center for Complementary and Alternative Medicine (NCCAM) at the National Institute of Health (NIH) we can find many naturally originating substances, which have been tested in the past few years in search of a hepatitis treatment (most of them are of plant origin). All details about the promising use of herbals including e.g. silymarin (milk thistle) or glycyrrhizin (licorice root extract) and many others were clearly described in a Modi et al. (2007) article2 . It is most important, to not rule out conventional medical therapy for hepatitis in exchange for an unproven alternative therapy. This of course also applies to the treatment of other diseases. In this article we want to introduce and approach a new and promising candidate in hepatitis complementary treatment - Agaricus blazei Murill (AbM). The first records of Agaricus being used to cure hepatitis have legendary roots. No doubt this fact pushed Inuzuka (2002)3 and colleagues into testing the Agaricus extract in the treatment of C-hepatitis. Preliminary data showed clinical effects of the A. blazei condensed liquid in human volunteers with an elevated activity of γ-glutamic-pyruvate transaminase (γ-GTP), a marker for liver damage. A total of 20 patients (half of which were men) with chronic C-type hepatitis received the extract orally, twice a day, for 8 weeks. Reduced serum γ-GTP levels were established in 80% of the patients without any toxicological findings or other side effects. It was concluded from these results that the AbM extract could be useful for patients with light hepatopathy such as C-type hepatitis. Hsu (2008)4 and his colleagues during the 1st year open-label pilot study intended to observe if the AbM extract can improve liver function in patients with hepatitis B. Four patients under 12 months of clinical observation with alanine aminotransferase (ALT) over 100 IU/L and not taking drugs for hepatitis were given the AbM extract (1500 mg daily for 12 months). The ALT level was taken as a major outcome measurement. At the end of the study, the main level of aspartate aminotransferase (AST) and ALT decreased from 246.0 (+/- standard deviation (SD) 138.9) to 61.3 (+/- SD 32.6) IU/L and 151.0 (+/- SD 86.9) to 46.1 (+/- SD 22.5) IU/L, respectively. This data indicated the potential benefit of the AbM extract in normalizing liver function of patients with hepatitis B, but controlled studies with larger samples should be performed in the future. In other studies a possible in vivo effect of orally taken AbM was examined in patients with IFN-α-resistant chronic hepatitis C virus infection (Grinde 2006)5 . It was observed that the viral load was slightly, but not significantly, decreased after 1 week of treatment. The treatment also seemed to up-regulate the gene for IFN-α-receptor. Additional studies examining AbM intake combined with regular IFN- α treatment would therefore be of interest. 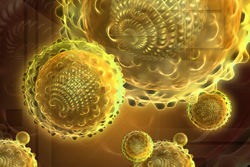 Thus, ABM may improve the effect of IFN alpha treatment in patients with chronic hepatitis. A potential role for Agaricus in the treatment of chronic hepatitis was noted by Wang et al. (1993) and data was published on a web site. They reported that a daily administration of 20mg of Agaricus blazei Murrill brought about various effects including hepatic function improvement and a negative index of virus activity in chronic hepatitis patients. The experimental group (10 patients) took Agaricus blazei Murrill and a controled group (10 patients) received ordinary treatment only. The result was compared 3 months later and it was confirmed that the treatment effect on the experimental group was significant in 2 and effective in 8 individuals, while the effect on the controled group was significant only in 1, effective in 6 and ineffective in 3 persons. Each of measurable parameters like the level of GOT (glutamic oxaloacetic transaminase) and GPT (Glutamic-pyruvic transaminase) activity, connective bile acid, serum iron protein, total bilirubin and prothrombin values of the experimental group indicated the mushroom's remarkable effectiveness in keeping hepatic function in order. At the present moment we have not any good and effective drugs against chronic hepatitis, especially the C type infections. All these examples of clinical data have shown that Agaricus blazei Murill could be a promising remedy in hepatitis treatment especially for patients with the resistant type of the disease. There is no doubt that further controlled clinical studies are needed to confirm the usefulness of AbM in hepatitis treatment in order to exclude toxic side effects (Mukai 2006)6. 1) Mowat AM. Anatomical basis of tolerance and immunity to intestinal antigens. 2) Modi AA, Wright EC, Seeff LB. Complementary and alternative medicine (CAM) for the treatment of chronic hepatitis B and C: a review. Antivir Ther. 2007; 12(3): 285-95. 3) Inuzuka H, Yoshida T. Clinical utility of ABCL (Agaricus Mushroom Extract) treatment for C-type hepatitis. Jpn Pharmacol Ther 2002; 30:103–7. 5) Grinde B, Hetland G, Johnson E. Effects on gene expression and viral load of a medicinal extract from Agaricus blazei in patients with chronic hepatitis C infection. Int Immunopharmacol. 2006; 6(8): 1311-4. 6) Mukai H, Watanabe T, Ando M, Katsumata N. An alternative medicine, Agaricus blazei, may have induced severe hepatic dysfunction in cancer patients. Jpn J Clin Oncol. 2006; 36(12): 808-10.